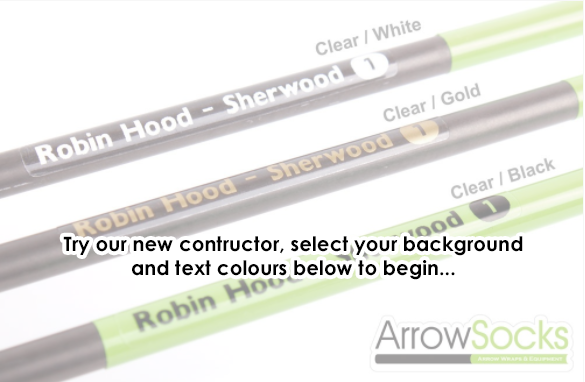 The simplest and quickest way to make your arrows identifiable - a requirement for many competitions. 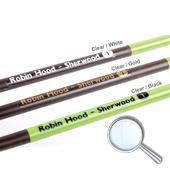 We sell these labels in strips of 36 labels, simply peel and stick to your arrow shaft where you require them. They will adhere to Aluminium, wood and carbon shafts permanently. 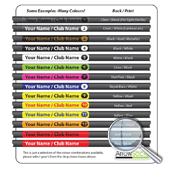 Choose from a range of numbering options and a massive variety of colour combinations. Now availabe in CHROME RED & BLUE as well as MIRROR SILVER & GOLD! If you can't see the colour combination you want - please contact us to discuss. In most cases they aren't displayed as they wont work well, but there are sometimes exceptions to that rule! Delivery is calculated at checkout and is normally within 48 hours (UK) - but this does depend heavily on Royal Mail’s performance. We aim to dispatch in under 24 hours. We also offer worldwide delivery. Mistakes can happen, we’re only human so on the odd occasion items are received which are not correct. If this happens please get in touch asap, ideally with a photo of the issue so we can rectify the situation quickly and without fuss. Please do not return anything without contacting us first - mainly because in most cases the items will not need to be returned. Especially so if they are customised. A quick and simple way to identify your arrows, as required in many competitions. Please note these are NOT full wraps, just labels as pictured. Personalised wraps are available in our shop. These labels come in packs of 32 labels, normally 1-12 3 times and a few spares labels but we can do any combination required (just let us know when you order). Choose from the array of colours available in the drop downs at the top of this advert. * Please note: colours with an asterisk next to them will not work well on a clear label, if it is stuck to a dark surface. For example sticking a clear label with yellow print onto a black carbon arrow - will not work well, these colours are semi transparent. Black, White, Silver & Gold are the best choice of colours for clear labels. Vast array of colour combinations, from subtle to loud! Supplied with 4 unnumbered labels for replacements or use on other items. Fast Service. Quality stickers and look awesome on my arrows. This site is now my first stop when looking for accessories from now on. Excellent quality and striking name/number labels. I ordered these and received them the next day - very high quality and they look great on my carbon arrows (label was black background with red writing. Would highly reccommend these. I'd recommend these to anyone; really easy to apply, simple but very effective! 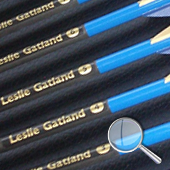 Gold lettering on a clear label looks incredible on carbon arrows.